ER Editor: postponing the decision on whether or not to renew the glyphosate licence just leaves me shaking my head in utter disbelief. A few days ago we published an article on a new study which shows that around 45% of Europe’s soils are contaminated by glyphosate and its metabolite, AMPA. To quote this article, “Pesticides, once used, do not dissolve into thin air, but persist in the environment, contaminating soil, air and water. This is the most recent red flag to emerge as a result of a new joint study by the University of Wageningen, the Joint Research Center of the European Commission and RIKILT laboratories – recently published in the scientific journal “Science of the Total Environment.” Equally baffling is the recommendation some EU member states have made for 5 or 10 year renewal terms (see below). This is an issue about effecting a complete ban, not dribbling along with endless renewals putting the health of people and the environment even more at risk. When will citizens more generally wake up to the fact that the EU favors the interests of corporations and their lobbyists, not its own people. EU member states have postponed voting on whether to renew the licence of weedkiller glyphosate on Wednesday (25 October), the European Commission said in an emailed statement. “The Standing Committee on Plant Animal Food and Feed met today to discuss renewing the approval of the active substance glyphosate,” said spokeswoman Anca Paduraru on behalf of the EU’s executive. “At the conclusion of the meeting, no vote was taken,” she said. The licence for glyphosate, used commercially in a Monsanto product called Roundup, is due to expire at the end of the year. Although two EU agencies have recommended it as safe, environmental and health activists have turned against the proposal to renew the licence, in part because the World Health Organisation’s International Agency for Research on Cancer has classified glyphosate as “probably carcinogenic to humans”. A previous attempt to renew the licence for fifteen years failed to reach a majority of support among EU member states, following which the commission proposed a 10-year renewal. 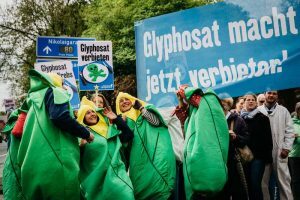 On Tuesday (24 October), the European Parliament adopted a non-binding text calling for the phase-out of glyphosate in the coming years, with a compete ban by 2022. Shortly after the vote, the commission announced it would propose a licence period of five to seven years. During Wednesday’s meeting, member states exposed their positions, mainly favouring a 5,7 or 10-year renewal. But it appeared that none of them would gather enough support to be adopted. An EU source said “quite a few” member states were still in favour of a 10-year renewal – and that ‘phasing out’ was not considered, as that fell under different legislation. Some national representatives said they needed to talk more with their government. “The commission took note of the positions of the different delegations of member states upon which it will now reflect and will announce the date of the next meeting shortly,” Paduraru said. The meeting will most likely take place in the first half of November. The EU needs to take a decision before 15 December, when the current licence ends. Ahead of the vote, Greenpeace had already criticised the commission’s compromise proposal. “What matters is how much glyphosate is used and how it’s used, not how long the licence is for,” the campaign group said in a press release. “The European Parliament and Europeans want a ban, not a fudge that changes nothing about how much people are exposed and how much the environment is contaminated,” Greenpeace added.